On Jan 27/12 we held another protest where, again, police, occupiers and their anarchist supporters paid no attention to my sign. But, when we began to put up signs reflecting the truth that ‘non-native’ people who are excluded from the area include Black people and Jewish people as well as Whites, the OPP became enraged and ripped down the first sign, then arrested Gary McHale and threatened other non-natives with arrest for breaching the peace — even though we were the victims of native thugs who were swarming and assaulting us and deliberately interfering with our access to hydro poles on public property as police – typically – stood by and watched. I was assaulted by the woman in the photo (R) who tried to destroy my sign. (No arrest, of course). Caledonia resident Randy Fleming (one of four people arrested for walking down the road with a Canadian flag) was assaulted by another woman who blocked his attempt to climb a ladder which caused him to lose his balance and fall. A journalist captured the scene on video, but an OPP officer immediately claimed no assault took place, that Fleming was faking his fall. 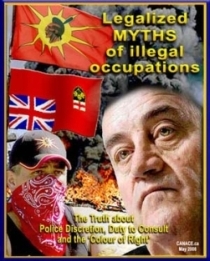 …McHale explains, in his weekly Regional News column below, why he was arrested for the fifth time in Caledonia (not once has any charge ever come to trial) for daring to point out that Ontario’s Dalton McGuinty government does not allow Jews and Blacks to simply walk down the county-owned road through the native-controlled — but provincially-owned — Douglas Creek Estates. Be sure not to miss Jeff Parkinson’s video story immediately following Chris Pickup’s editorial. This past Friday I was arrested but released within 20 minutes with no charges. While the media was recording the OPP, they told us if we walked on roads on DCE we would NOT be arrested for trespassing. I guess that is their way of admitting the arrest of the Caledonia 8 on Dec. 3, 2011 wasn’t lawful – McGuinty doesn’t own the roads, Haldimand County does. At issue in Haldimand are racist policies of the McGuinty government and OPP. 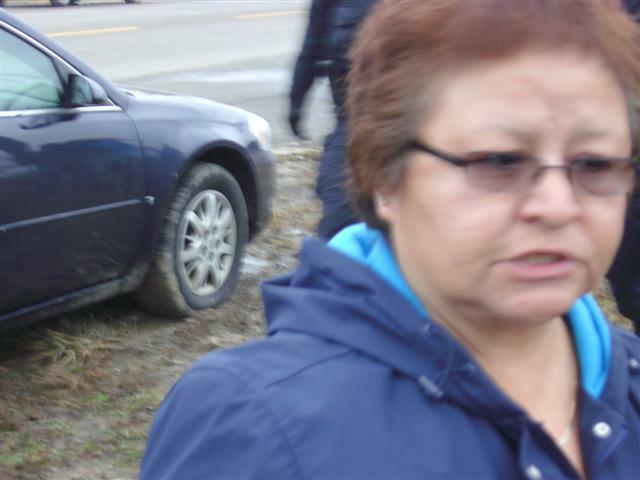 They will not arrest Natives committing serious crimes while arresting and charging non-Natives on bogus charges. It isn’t hard to see examples in recent history of how violating one group’s civil rights or allowing another group to have special rights has devastating effects. I have met with many Jewish people who are concerned by how the OPP has been allowed to target people. About two weeks ago I met with a couple of new immigrants to Canada at the locate Tims in Caledonia. Both live in Toronto and came out to a few rallies and saw the OPP targeting non-Natives people. One had immigrated from Japan and runs a Japanese website. The other was born and raised in a European Communist county and also runs a website. Both have been updating their websites about the real dangers of Race Based policing. We would be wrong to believe that we, in Canada, can never possibly see such racist attitudes that created problems in Southern USA or in Germany. On Toronto First Synagogues’ website they state how, at the Toronto Beaches area there were signs saying “No Jews and No Dogs” in the 1920-30s. 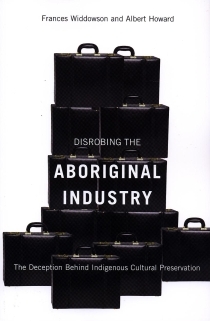 Remember, we interned Japanese during WWII, had a Chinese head tax and what about our racist treatment of aboriginals in the 1800-1900s. Our politicians refused to learn from past racist policies and instead simply change the group being targeted. 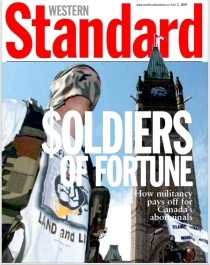 It should be noted that Canadians didn’t stand up against the Head Tax or the internment of Japanese so are we, as a People, willing to allow our government to target groups of people? 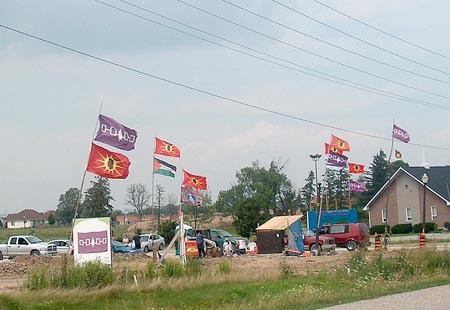 When the occupation of DCE started five Palestinian groups helped finance the occupation, and a Palestinian flag [photo, R] was raised on DCE. Since then several anti-Israel protesters were seen on DCE including last Friday. At McMaster the same protesters on DCE are organizing Six Nations/Palestinian struggle events which various Jewish groups are now starting to be upset over by the ongoing anti-Jewish rants. 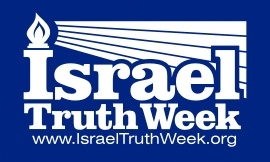 Last Thursday night McMaster hosted Zafar Bangash, president of the Islamic Society of York Region, as a speaker – the Spectator reported Mr. Bangash as being “known for his strong anti-Israeli views and for advocating Iranian-style theocracy” stating that the Friends of Simon Wiesenthal Center for Holocaust Studies in Toronto had complained. 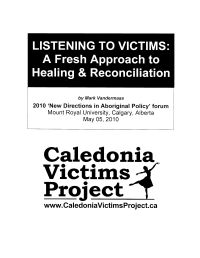 There is a growing concern by those who have been victimized in the past that the issues in Caledonia are the beginning of a serious trend toward targeting any group for whatever reason the government wants. In March of last year we met with 3 well known Jewish people – two of them had lived through Nazi Germany. 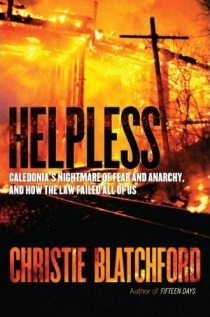 They had read Blatchford’s book and were greatly upset by what was happening and thus they wanted to find ways to help cover the court costs of fighting against what the OPP are doing. We accept the reality that racist policies that go unchecked will lead to more and greater abuses. This is why we fight so hard to restore the Rule of Law – we cannot allow racism to gain a foothold within police policies. Last Friday we planned to raise three signs on the hydro pole, as is our right, which reflect the truth about policing in Caledonia. 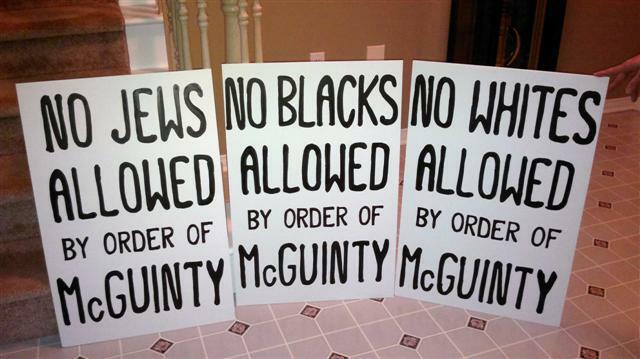 The signs stated, “No Whites Allowed by Order of McGuinty”, “No Blacks Allowed by Order of McGuinty” and “No Jews Allowed by Order of McGuinty”. These signs clearly explain the current policing policies in Caledonia and demonstrate the real danger of such policies being allowed to continue. Prior to raising these signs I wanted to get the views of various Jewish people to ensure that they saw Caledonia as a key issue in the battle against racism. The following statement was provided to me to be used. Let’s be clear, Race Based Policing in Caledonia is a real danger for everyone’s future in this province. Do not believe that we are exempt from radicals who will use violence as a way to force police and governments to establish special rights for them – just look to Europe as proof of what can happen regarding Sharia Law. I will not apologize for raising a sign that warns all Canadians of what happens when racist police policies become the norm. I will raise the same signs again. VoC Note: Gary McHale is the co-founder and Executive Director of Canadian Advocates for Charter Equality (CANACE). 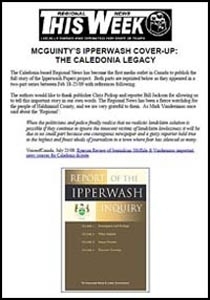 His ‘Caledonia resume’ can be found here. Oh what heroes our cops are! 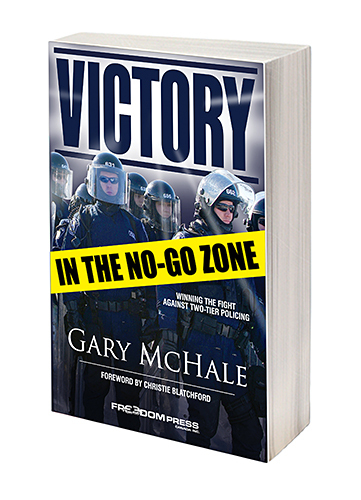 During Friday’s demonstration on the DCE, our 5ft 100 lb female reporter was shoved by a burly cop who was attempting to stop her taking the same picture three other reporters were taking … namely, the arrest of Gary McHale. The only reason she didn’t hit the ground was because she landed on a nearby parked car. “What are you doing?” this brave cop asked. “I’m a reporter trying to do my job,” she replied. “That’s f…..g wonderful but keep away,” says this wonderful specimen of those “peacekeepers” tasked with keeping us all safe. Asked for his name and badge number, he turned away and repeatedly refused to answer. Of course, the police are madated to give their badge number when asked, but not this one. Congratulations cop-whoever-you-are. You just made another unbeliever in the sanctity of the oath you took when you became a member of the force. 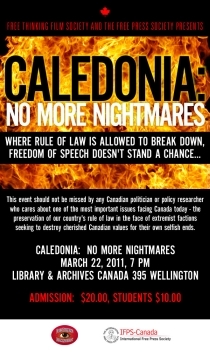 And welcome to Caledonia Kristin, where the law is turned upside down and inside out. We might just as well be down the rabbit hole with Alice in Wonderland. Of course, the right thing would be for this cop to come forward and apologise, but that’s not likely. Meanwhile Kristin is left with that queasy feeling we all get when we find out for the first time that cops are not the decent, law-abiding people people we were trained by our parents to believe they were, and that they won’t keep us safe while we go about our legitimate business. 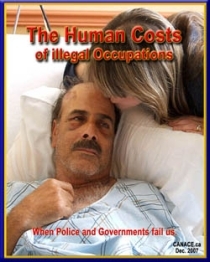 They’re all too busy trying to keep their jobs and pensions while violating the oaths they swore when they became members of the force, and in the process enforcing a definite racial divide in the enforcement of the law. Oh…but native activist Ruby Montour was allowed to shove Randy Fleming off a ladder with impunity. 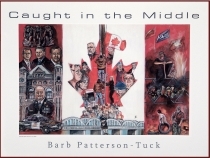 It’s the same old, same old, but nothing will change while Caledonia residents and and so-called ‘movers and shakers’ of the communitykeep their heads firmly down the rabbit hole, brown-nosing Dalton McGuinty. 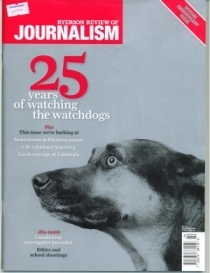 VoC Note: The Regional News does not publish an online edition. CANACE co-founder Jeff Parkinson captured the irony of the situation as the police allowed native radicals and supporters of their lawlessness to swarm us and attempt to block us to prevent us from putting up our signs, all the while accusing us of being racists. After continually accusing McHale of racist motives, and of being a white supremacist, Keefer can be heard at the 14:50 mark saying, “You’re making it sound like Six Nations is opposed to Jewish people. That’s what your attempt was.” Clearly, Keefer knew full well that we were not promoting racism, but exposing it. Gary McHale noted in his article some of the Toronto signs from the 1920’s which said, ‘No Jews and No Dogs.’ I recall searching Land Registry documents in the 1970’s and finding a chain of title that included transactions for property sold with conditions that the buyer not sell them to Jews. I was shocked. Our use of signs labelling the occupation site as being a government-segregated ‘NO JEWS’ or ‘NO BLACKS’ or ‘NO WHITES’ area makes people uncomfortable, and that’s a good thing. The ugly truth about racial policing should make people squirm. This entry was posted in 1. VoC's MOST IMPORTANT POST, Caledonia Players, CANACE News, Crimes Against Democracy, CUPE, Doug Fleming, Freedom of Expression, Gary McHale, How low can they go?, Jeff Parkinson, Mark Vandermaas, MUST SEE, Native Protests - Caledonia, One Law for All!, Photos, Racial Policing, Randy Fleming, Regional News, Tom Keefer, Uncategorized, VoC News and tagged Arrest of Gary McHale; Reporter Kristin Kaye; Chris Pickup, No Blacks allowed by order of McGuinty, No Jews Allowed by order of McGuinty, No Whites allowed by order of McGuinty. Bookmark the permalink.